What makes China’s citizens so thrifty, and why does that matter for China and the rest of the world? The country’s saving rate, at 46 percent of GDP, is among the world’s highest. Households account for about half of savings, with corporations and the government making up the rest. Saving is good, right? Up to a point. But too much saving by individuals can be bad for society. That’s because the flip side of high savings is low consumption and low household welfare. High savings can also fuel excessive investment, resulting in a buildup of debt in China. And because people in China save so much, they buy fewer imported goods than they sell abroad. 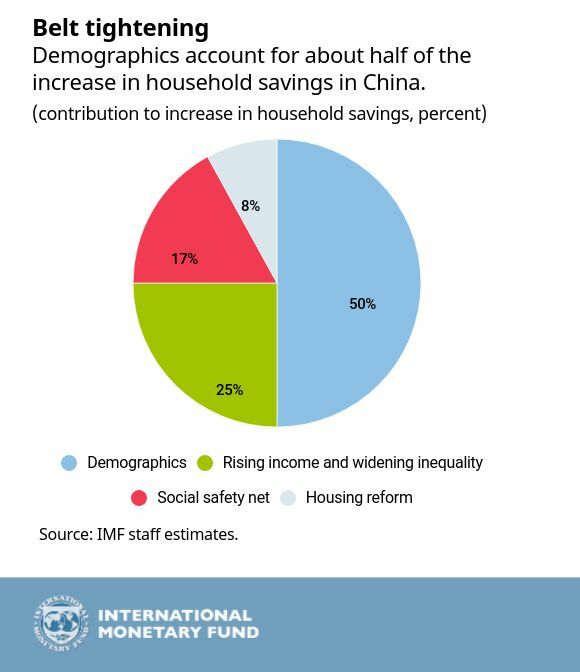 That contributes to global imbalances, according to a recent IMF paper, China’s High Savings: Drivers, Prospects, and Policies. The country’s authorities are aware of the issue and are taking steps to address it. China’s saving rate started to soar in the late 1970s. A look at some of the causes of the increase points to some potential remedies. Demographics explain about half the increase in saving, the Chart of the Week shows. China’s average family size dropped dramatically after the introduction of the “one child” policy. That influenced household budgets in two ways. Parents spent less money raising their children. At the same time, because children were traditionally a source of support in old age, having fewer children prompted parents to save more for retirement. Greater income inequality, resulting from China’s transition to a more market-driven economy, is also a big contributor. A wider gap between rich and poor increases saving because the wealthy spend a smaller proportion of their income on necessities and put more money in the bank. Economic reform has boosted saving in other ways. More Chinese now live in their own homes, as opposed to housing provided by state-owned enterprises. So they must save for a down payment and for mortgage payments. (Household debt, while still low, has risen rapidly in recent years, linked largely to asset price speculation.) And a decline in government spending on social services during the economic transition in the 1980s and 90s has meant that Chinese must save more for retirement or to pay for health care. Spend more on assistance to the poor, which would reduce income inequality.